Our hotels in Los Angeles area will plug you into car-free LA. No $25 overnight garage fees. No parking valets to tip. No tow away zones. Once you've checked into one of our metro-friendly hotels, you're just a few steps away from stress-free transportation. From luxury hotel rooms with a view of Kobe Bryant's workplace, to hipster-friendly youth hostels in Los Angeles, we've got lodging for every budget, including a sprinkling of "green" hotels who do good things for the earth like compost their food and landscape waste, use biodegradable key cards, and purchase local, organic produce. And if you're dying to find haunted places to stay, check into the Queen Mary and take your chances. The most metro-friendly of the hotels in Los Angeles area. It's a hotel and a Metro Station. Hollywood's newest shiny, sparkly luxury hotel stands atop a Metro station, making it easy to slip into the 300 thread count sheets after a car-free day of sightseeing. Casual, mid-range hotel close to all the Hollywood Blvd attractions. A welcome alternative to giant hotels, four furnished apartments in a quiet neighborhood, close to Hollywood attractions. This backpacker destination is near all the Hollywood sights and clubs. They offer walking tours, barbecues and open mike nights, so if that Beck look-alike with the out of tune guitar isn't cutting it, you'll show him. 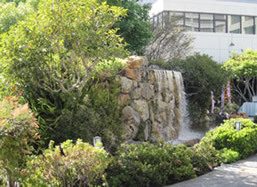 Mid-priced, suites-only hotel at the epicenter of Hollywood, just behind the Chinese theater. Romanesque, rococo, Spanish-Mission, gilded, frescoed and marbled, the Biltmore is from an era when hotels were destinations unto themselves. And the bar pours "The Black Dahlia martini", which makes the noir buffs among us feel all cozy. High rise, highly-rated (on Trip Advisor) downtown hotel, designed for tourists, business travelers and conventioneers. 24 stories of Hilton-ness in the Hollywood Hills, near the main entrance to Universal Studios and just up the hill from the Red Line Metro Station. Recently refurbished, right next to the Universal Studios tour and across the street from the Metro Station. An updated historic hotel in the heart of downtown, with a spectacular skyline view from the rooftop pool. This value-priced motel is on the edge of the Los Feliz shopping district; restaurants, bars and unique shops are all an easy walk. The first Academy Awards were held here. Douglas Fairbanks and Mary Pickford financed its construction. The ghosts of Marilyn Monroe and Montgomery Clift are said to haunt the halls. David Hockney painted the Olympic-size pool. And they also rent rooms. This mid-range Japanese Hotel in Little Tokyo features a health spa, karaoke bar and the bathrooms are equipped with Japanese washlets (the ultimate in personal cleansing, if you were wondering). They have a library. Not the first thing you look for in a hotel, but we're big readers, so we approve. Otherwise, we'll call it "executive plush" and point out its location close to the Pasadena Museum of California art and other Old Town attractions. One of the greener hotels in Los Angeles area. The only hotel in Pasadena to win two palms from the California Green Lodging Program, which means they do things like minimize waste and focus on energy efficiency. When we lodge, we love to lodge green. Opened in 1924, the Culver Hotel is legendary. The Munchkins allegedly ran amok there while shooting The Wizard of Oz; John Wayne supposedly won it from Charlie Chaplin over a hand of poker and later turned down offers from the Black Panthers to make it their headquarters; Greta Garbo, Marilyn Monroe, Frank Sinatra and Ronald Reagan all stayed here. Flanked by a giant digital screen projecting highlights of LA sports and entertainment, the new Marriot feels like the Hotel Blade Runner, if "Blade Runner" was clean and sleek and had a rooftop pool bar. A restored 1920's hotel, updated to "boutique" status, the blue and white trimmed Varden is Long Beach's #1 rated hotel on Trip Advisor. 4 star hotel with shoreline views from the rooftop pool. Close to Long Beach's aquatic attractions and The Catalina Express is just a stroll away if you feel a yen to get off the North American continent. Luxury shoreline hotel, Energy Star rated by the EPA and the winner of two Palms from the California Green Lodging program. This art deco seagoing landmark from the golden age of travel is also a museum, a restaurant and a concert venue. Plus, it's haunted. Spend the night on one of 5 yachts anchored at Rainbow Harbor.